The corporatocracy of Australia moves from nobbling our ABC to crippling CSIRO's reporting on sea-level rises, as the Turnbull Government caves in to its paymasters. Peter Boyer reports. 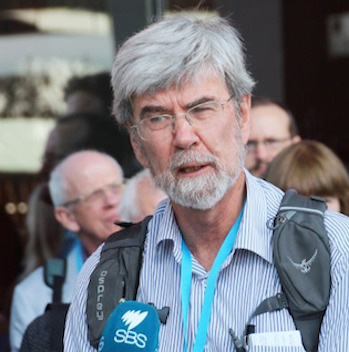 THE DEMAND by CSIRO management that its leading sea-level scientist, John Church, explain why he shouldn’t be sacked is as unbelievable as it is outrageous. On an individual level, it is an appalling way to treat the person who has done more than anyone to put CSIRO at the forefront of sea-level studies and whose name, on research paper after research paper, has become virtually synonymous with world-leading climate research. Church was at sea, aboard the new marine research ship Investigator on a transect from Antarctica to New Zealand, when told over the satellite phone that he was on a redundancy hit-list. He has until mid-June to put a case against his termination. More than 300 staff are losing their jobs at CSIRO. Church’s oceans and atmosphere unit is losing 74 positions, with hundreds more positions going from the land and water, agriculture, minerals, food and nutrition, and finance units. The climate science losses are happening mainly in Melbourne, Canberra and Church’s home city of Hobart, with positions also going in Queensland, the Northern Territory and Western Australia. CSIRO has long led the world in modelling Southern Hemisphere climate. The current threat to that capacity has been met with dismay from leading institutions and thousands of scientists around the world, expressed in multiple letters to prime minister Malcolm Turnbull. It’s been a matter of Australian pride that our CSIRO is recognised globally as a great scientific institution. Now, thanks to a cavalier chief executive and a hapless, clearly dysfunctional board, we’re seeing that good name trashed. The impact will be felt for many years to come. Disclosure: I have known John Church for many years. Our children shared a school and our paths have crossed many times over the years. But I know that many share my high opinion of him. His scientific intelligence and unmatched grasp of his chosen field brought global acclaim, but all who know him put highest value on his open, equitable demeanour and his decency, honesty and modesty. He’s surely everyone’s model scientist. Ever the loyal employee, he remained mute over recent years as his organisation suffered repeated funding cuts. But chief executive Larry Marshall’s declaration in early February that CSIRO no longer needed to observe, measure or model climate was a bridge too far. The day after Marshall announced his proposed restructuring, Church publicly stated that the job cuts would severely diminish Australia’s ability to fulfil its commitments under the Paris climate agreement. “I’m very saddened for the younger scientists who really are important for Australia’s future, and for the message that this sends to the world about doing environmental science in Australia." “... to help address issues important to Australia and its neighbours." Those resources and the capacity to use them effectively have been put at risk. Church has previously said he expected to lose his job. He now says that while he will point out “errors of reasoning” in the case for the redundancies, he does not intend to argue for his retention. “I am not sure I can work with the current management." The news will be a shock to scientists around the globe who assumed his professional stature would protect him. The CSIRO redundancies are doing irreparable damage to Australia’s scientific reputation — a reputation earned not over a decade or two, but generations. The most disturbing aspect of the sackings is the silence of CSIRO’s putative master, the Federal Government. Turnbull, science minister Christopher Pyne and environment minister Greg Hunt have all declined to comment. Appointed under former PM Tony Abbott, Marshall was smart enough to link his plan to “use innovation to help Australia navigate climate change” to Turnbull’s own “innovation nation” ideas. But Turnbull could have stopped the job losses with a phone call. Although much damage has already been done, that is still an option. His failure to intervene may cost him political capital in the election, but more to the point, it will cost the country. From the prime minister down, this is a disgraceful performance that brings shame to Australia. This article was originally published on 17 May 2016 in SouthWind and is reproduced with Peter Boyer's permission.You can follow Peter on Twitter @PeterBoyer8. @hannj666 Selling off ABC & SBS is IPA agenda items 50 & 51 also IPA wants to privatise the CSIRO!!! OPPOSE NOW—GET RID OF THIS GOVT.